Allowing the Chakras to stay clear and open, permits more energy to flow through your body, which is essential for your vitality and health. It is possible for these energy centers to become idle or closed when we are experiencing ill health in the related body area or when we are emotionally shut down. Chakra clearing is a mechanism whereby the energy centers can be opened through the use of vibration created by sound. There are seven major Chakra centers running from the base of your spine to the top of your head following the colors of the rainbow. Each Chakra is associated with a specific color, corresponding musical note, part(s) of the body, sound and gemstone. 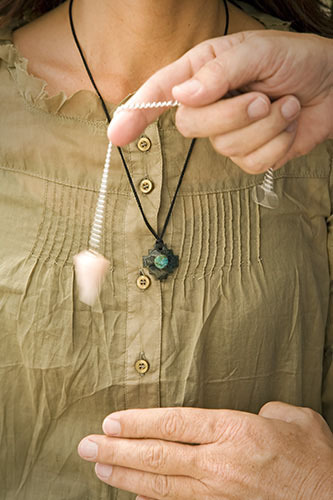 In her work with clients, Loretta first tests the openness of each Chakra using a pendulum. She then uses harmonics and non-touch healing intention to open the Chakras and restore the body to free flowing energy or balance the amount of energy running through each Chakra and from one to another. Chakra Energy Balancing directly opens and moves the energy in the body’s electromagnetic field to eliminate blocks and disharmony. This site is only for entertainment purposes. Information provided does not constitute legal, psychological, medical, business or financial advice. You must be 18 years or older to request a Chakra Balancing session. Copyright © 2009, ThePsychicPartners.com. All Rights Reserved.